Amore's Pizza on Dupont Road. 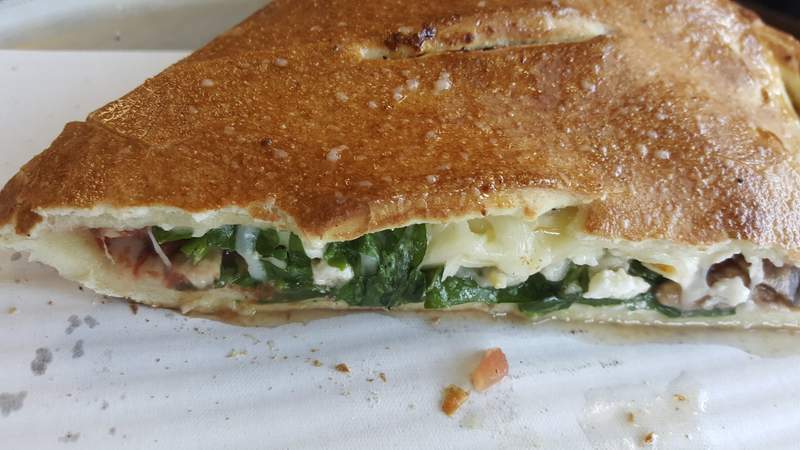 A mushroom and spinach roll from Amore's Pizza on Dupont Road. 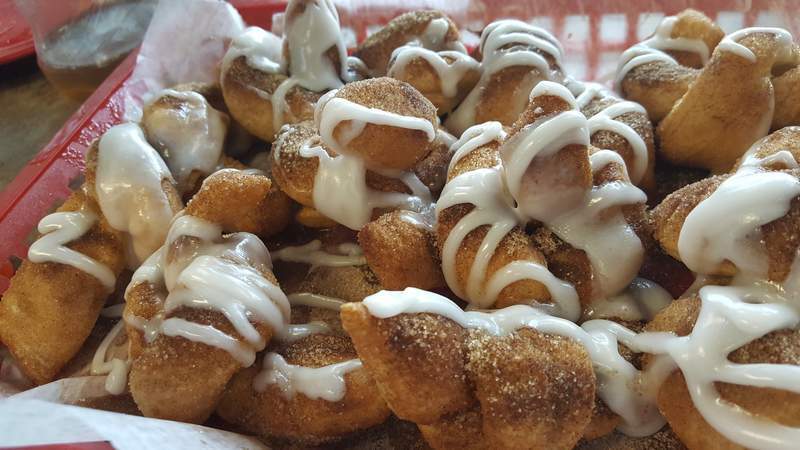 Dessert dough knots from Amore's Pizza on Dupont Road. 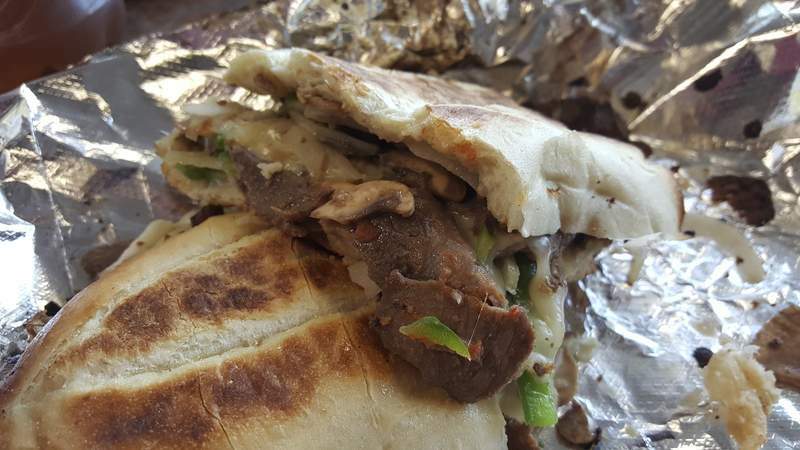 A steak and cheese sub from Amore's Pizza on Dupont Road. 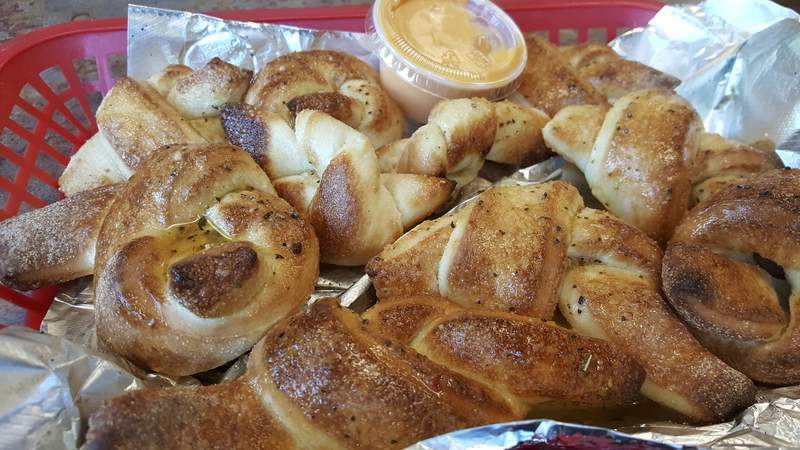 Garlic dough knots from Amore's Pizza on Dupont Road. 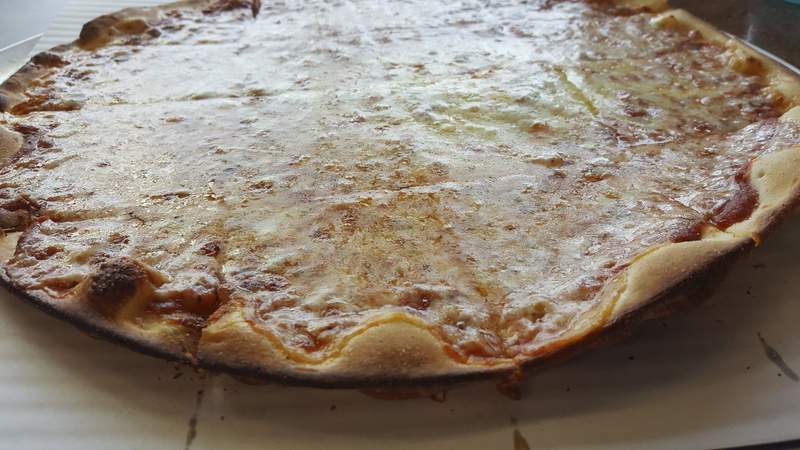 A thin and crispy cheese pizza from Amore's Pizza on Dupont Road. 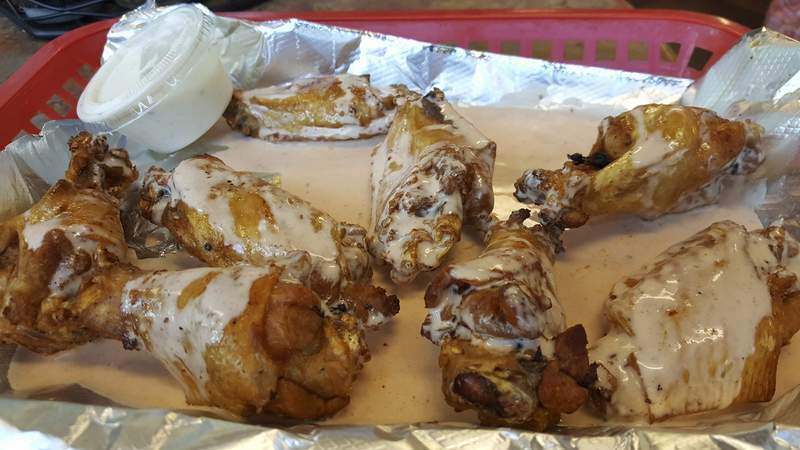 Chicken wings with the white mild sauce from Amore's Pizza on Dupont Road. 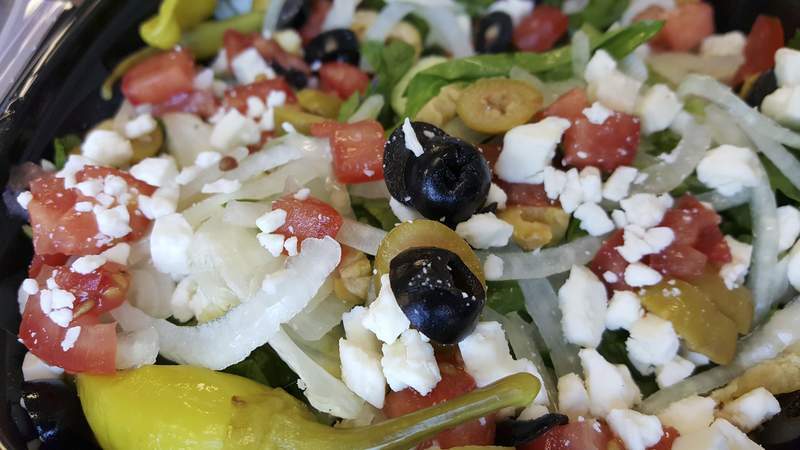 Greek salad from Amore's Pizza on Dupont Road. 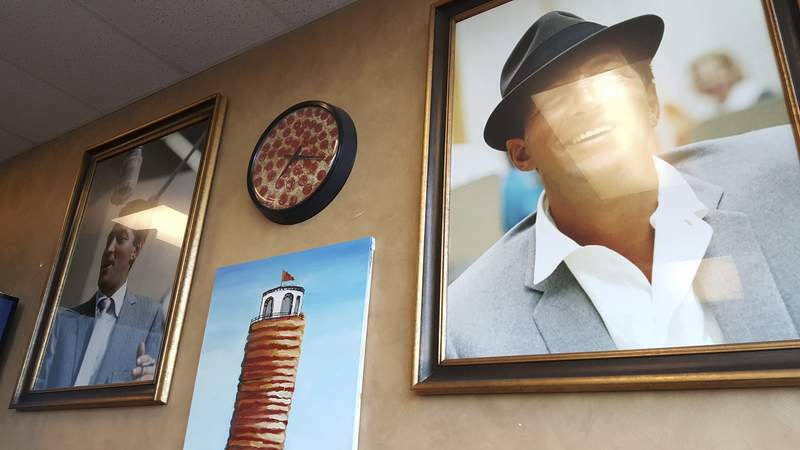 Dean Martin posters adorn the walls of Amore's Pizza on Dupont Road. A Fort Wayne Hoosier Supreme pizza done Chicago style from Amore's Pizza on Dupont Road. There are so many pizza places in Fort Wayne that it takes some convincing to get me to try a new one. If I don’t hear any buzz about a place, I will just stick to one of the places I know I like. 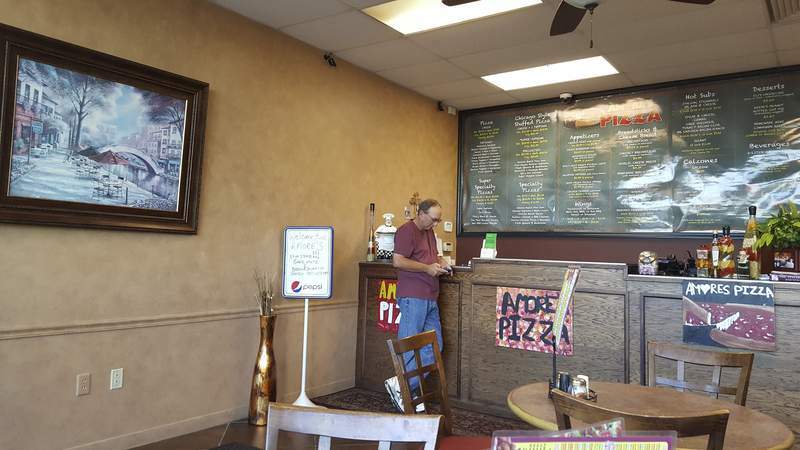 When Amore’s Pizza opened along Dupont Road about five years ago, I waited to hear how it was. And I waited. I never heard much except for a story from a co-worker during the restaurant’s infancy about a disastrous carry-out order. But just recently, the buzz began. First it was a neighbor who raved about the Chicago-style, deep-dish pizza. 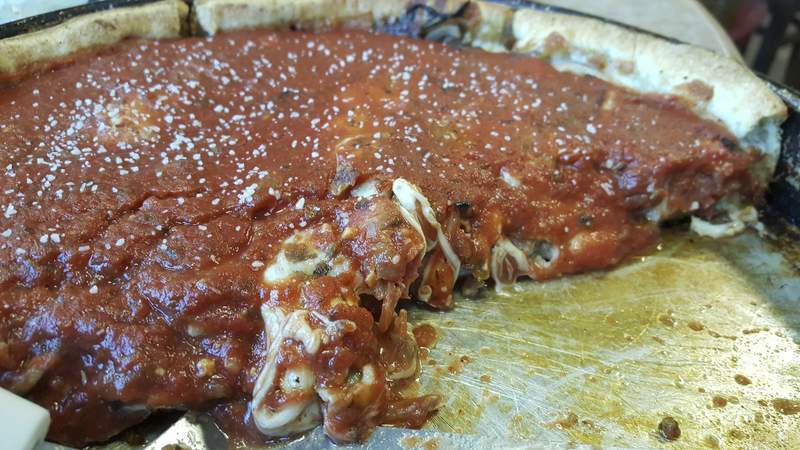 Then it was an email from someone who also loved the Chicago pie. My interest was piqued. One reason the buzz took so long may have been the fact that Amore’s only started serving the Chicago pies about three years ago, when it got a new owner, Steve Fiacable. That wasn’t the only change either, Fiacable told me; pretty much everything is different now. The changes were good, because Amore’s impressed, and I will now be doing my part to keep the buzz going. It is mainly a carry-out place – it has just 12 chairs for dining in – but Fiacable loves having dine-in customers and wishes he had room for more. The space is clean, with some nifty touches like Dean Martin photos along one wall. And when I dined in, the service was better than most sit-down places with a much larger space and staff. I had to try a Chicago pie first and chose the Fort Wayne Hoosier Supreme, with pepperoni, American sausage, mushrooms, onions and green peppers. The toppings were plentiful, the cheese was of high quality and pulled away in long strands, and the crust was super crisp on the bottom – not an easy thing to pull off. That bottom crust was crisper than any Chicago pie I have had outside the Windy City. One of the employees said it took Fiacable a couple of months to get the Chicago pizza just right and added, "We loved eating up all of the mistakes." I was a bit miffed to only see crushed red pepper on the table and no parmesan, but that turned into joy after I asked my server for some. She fetched a shaker from the soft drink cooler next to my table, and that shaker was filled with fresh Parmigiano-Reggiano cheese. Fiacable grates all the cheeses for his pies and uses the king of Italian cheeses in his shakers. Find me another take-out pizza place that does that. As happy as I was with the Chicago pizza, I found myself torn when I tried my first slice of hand-tossed pizza. The crust on this beauty was tremendous. It had a strong yeast flavor and really sort of reminded me of crusty fresh-baked bread. Add in that the edges were brushed with a mix of olive oil, basil, oregano and garlic, and there was nothing not to love about it. As if deciding on what kind of pizza to get next time wasn’t hard enough, Amore’s thin-crust pizza also impressed. This cracker-thin crust was very crunchy and had the same flavor as the hand-tossed, but there was less of it, so the tangy sauce was more prevalent. It was a well-made sauce, too, so its flavor was welcome. So with three distinctive crusts with three distinctive flavor profiles, Amore’s has something for pretty much every pizza lover. And if you are not a pizza lover, there were some other great finds, starting with a salad that blew away what most take-out places produce. The Greek salad was made with a mix of romaine and iceberg that had a little fresh spinach added to it. Amore’s was not stingy with the feta cheese cubes, and there were a lot of black and green olives, along with onions and tomato. Fresh spinach made the mushroom and spinach roll a winner. This meatless take on the classic sausage roll had a tasty dough shell and was stuffed with just enough of the name ingredients and cheese. The chicken wings were also a step above. Most pizza places can’t master wings because they are baked instead of fried. Even though they get a little crisp in the pizza oven, it is usually never enough. Amore’s has a deep fryer and fries the wings first before finishing in the oven to make them extra crispy. The sizable hot wings were perfect, with plenty of heat, but the mild wings puzzled me at first. Amore’s mild sauce is white with just a hint of orange, which kind of stunned me upon first glance. The mild sauce is made by mixing ranch dressing with hot sauce, and that mix was a tasty one. I think a more descriptive name is needed, however, because the ranch flavor is noticeable and may not be welcome by those expecting traditional sauce. The only thing I really didn’t care for during my visits was the steak and cheese sub. My server said it was her favorite, and given how good all her other tips had been, I wasn’t about to question her. The sandwich had a lot of white onion that kind of took over, and the meat was sub-par, which is what I feared at a pizza place. The biggest fault was that it was dying for sauce. It had some red sauce on it, but not enough. I got a side of barbecue sauce, and that helped, but not enough to make me get it again. What I will be having again are the dough knots. And I will be having them before and after my meal. The same flavorful dough in the hand-tossed pizza was twisted up, baked and slathered with herb-infused garlic butter. I enjoyed every one and didn’t use the side of cheese sauce, which was sadly served cold. The knots also made for a great dessert when dusted with cinnamon and sugar and drizzled with white icing. I also know that I will have to try the fresh-baked cinnamon rolls next time because given how much I love Amore’s dough, there is no way I won’t love these.